Jorge's Place: BROADWAY 2011/2012 – THE REVIVALS SEASON? BROADWAY 2011/2012 – THE REVIVALS SEASON? Last season, Broadway saw the opening of several new musicals and only two revivals, but things look different for the new season. The new musical SPIDERMAN: TURN OF THE DARK, a leftover from last season, finally had it’s opening, becoming the first musical of the 2011/2012 season. Frank Wildhorn’s BONNIE & CLYDE (this guy got guts, after the flop of WONDERLAND is already back) will follow soon. 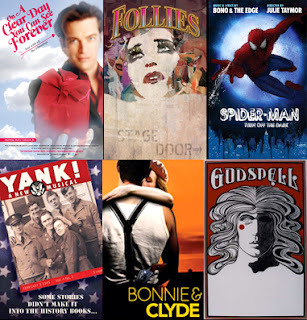 But, besides those, the only new musicals announced are the Off-Broadway transfer YANK!, with music by Joseph Zellnik and book & lyrics by David Zellnik, and the “new” Gershwin’s musical NICE WORK IF YOU CAN GET IT (inspired by OH, KAY!) starring Matthew Broderick and staged by Tony Winner choreographer Kathleen Marshall. The other planned productions are all revivals. Andrew Lloyd Webber’s EVITA brings Ricky Martin back to Broadway, with Elena Roger in the title role. The last and winning revival of HAIR returns, with its national tour, for a limited run. Stephen Schwart’s GODSPELL will finally have its long announced revival. Kennedy Center’s production of FOLLIES transfers to the Marquis Theatre, but only for a limited run. Roundabout Theatre’s production of Bob Fosse’s DANCIN’ directed by Graciella Daniele. And Michael Mayer will direct Harry Connick Jr in his reconceived version of ON A CLEAR DAY YOU CAN SEE FOREVER. Let’s see what surprises this Broadway season has in store for us musical lovers. Surely someone will have the good sense to move SPIDERMAN (which got all the nominations it deserved LAST season) into the Special Event category - it is more circus than show if that isn't giving it too much credit - and let Hugh Jackman have a little illusory competition. Here in the UK,London's WestEnd is as usual very shy of admitting to flop musicals. A very expensive production of Lend me a Tenor bombed,Umbrella's of Cherbourg and Betty Blue Eyes, good reviews, both flopt and the surprise hits are Ghost the Musical and Matilda The Musical packing the house full every night. Saw a cracking good touring version of Sister Act 2 weeks ago and the next major tour coming here to Brighton soon is Legally Blond which closes West End April 7th.Film and Theatre critic Mike Lang. Mike Lang.This site is new to me and if the USA would like show news from the UK i will be happy to do it. If you can use Google my book on Cine Variety and a memoir are there. Just type in cine variety and up will come my name and the book. All comments are very welcome good or bad.Email me anytime. What you said about the West End flops it's true. It seems the producers don't like to admit that their show flopped. Of the musicals you mentioned I wish I'd seen LEND ME A TENOR; I enjoy the cast recording and I'm sure I would have enjoyed the show. I gave a quick look to your Cine Variety and it seem very interesting. I guess you had a really rich life and have plenty of memories to share. I think that's great! Although my blog is in English, I'm a Portuguese guy living in Lisbon, Portugal, so I don't know if the USA "would like show news from UK", but Im sure I do.